the list goes on and on.p. So why would any student willingly go out of his or her way to ask the University to add one more to the list?p. For a motivated few who are doing just that, the answer is simple – it seems like the right thing to do.p. What this group is hoping to initiate is the addition of a diversity requirement to Notre Dame’s curriculum, consisting of one course specifically devoted to the study of marginalized people.p. “If students can become more educated about other cultures and other people’s struggles and accomplishments, then maybe there is hope that we can understand each other as future leaders of the nation,” said sophomore Rhea Boyd, one of the students behind the movement. “A diverse education is a valued asset to any person who wishes to contend in the world market.”p. 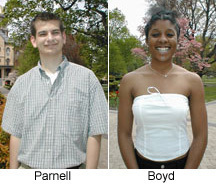 Boyd became involved in the initiative after reading an article in The Observer about affirmative action written by fellow student, sophomore Greg Parnell. The two held different positions on the issue, but when they became acquainted, rather than finding themselves at odds, they realized they shared a common goal – to create a healthy dialogue on diversity at Notre Dame.p. “What makes Notre Dame an excellent university is that it teaches its students life lessons that reach far beyond the classroom,” Parnell said. “The dorm life, religious aspect, study abroad programs, sports and community involvement all reflect this aim. The ability to understand and work with people of different races, ethnicities and backgrounds is another skill critical to the development of a healthy young adult, but which is often overlooked in other classes.”p. More students soon joined in the effort to introduce a diversity requirement to the curriculum, and together they took steps to begin the process of presenting a proposal to University administrators. Working through student government, the group sought help from the Campus Life Council, which immediately formed a subcommittee that went right to work laying the groundwork for such a requirement.The idea also found faculty support right away.p. “Because of the nature of school and residential segregation in the United States, many students who come to Notre Dame have had, sadly, few meaningful interactions with students of varied racial backgrounds,” said Tom Guglielmo, assistant professor of American studies. “It’s been my experience, as well, that many white students lack a sophisticated understanding of how race shapes the lives of all Americans in profound ways everyday. A ‘diversity’ course could address some of these issues.”p. Guglielmo applauds the students involved for overcoming their differences to work toward a common goal. He believes all students would benefit from a diversity requirement, especially since many likely would not enroll in such courses otherwise.p. “Some real exceptions notwithstanding, my sense is that the very students who think the least about racial, ethnic, religious, class, or gender diversity – and would therefore have the most to gain from a class on the topic – are often the least likely to enroll in such classes,” he said. “For this reason, I do think a diversity requirement is necessary.”p. There have been preliminary meetings between students and University officials on the subject, and the idea currently is under consideration. Boyd and others are optimistic that their proposal will come to fruition and that Notre Dame will soon have a new requirement on the books.p. “The future of our nation and of the world is becoming increasingly dependent upon international relations,” Boyd said. “A university like Notre Dame is the perfect setting to mold sympathetic and educated leaders – people with everyone’s interests in mind. A diversity requirement would make this goal a reality.”p. Originally published by Julie Hail Flory at news.nd.edu on May 17, 2004.